In March 2009, I took my first spin through the Cincinnati International Wine Festival, doing my level best to spin and sip my way through most every booth in the place. The sheer number of tastings I did eventually overwhelmed me, my taste buds, and – as you can see – my tooth enamel. A bit of youthful hyperbole? Sure thing – but it *was* a really good wine which had enough power to blast its way through the thick coating of tannin that was undoubtedly wrapped around my tongue by the time I tried it on that March day. While I hadn’t run into an occasion to pick up a bottle over the years, I always remembered it, and I was excited for the notion of having my way with an entire bottle of the stuff! Fast forward to late 2014. Your favorite companion in the wine review world got an email from Toby at Fineman PR, asking me if I’d like to sample the 2011 vintage of Faust. With memories of my previous brief dance with this devil in my mind, I quickly agreed. Much like it’s namesake’s winding journey to salvation in that German poem, this bottle took some time to get to me. A bit of a shipping mishap and some ridiculous state import laws kept the bottle from me for a time, but Toby eventually succeeded in getting me a bottle of the just-released 2012 vintage. I did some decanting, grilled up some veal loin chops, rousted the Sweet Partner in Crime from her end-of-semester grading and set to tasting. OK, first off – “extracted” still qualifies as an apt descriptor here. This is a Napa cab, through and through. Most of what I wrote for the 2006 holds true today. There are still big, bold red and black fruits on the nose and on the palate, which is rich and packed with tannin that definitely needs some air to unwind. The finish is long and chewy. It smooths out a bit as the evening winds on. Since this is the just-dropped vintage, I thought it’s still drinking pretty young. Six more months in bottle would do the integration of this wine a world of good. The SPinC was more succinct, “It’s just too much for me,” she quipped, “I remember loving wines like this, but my palate just isn’t set up for this one anymore.” I understood where she was coming from. I still liked it more than she did. With the veal chops, I was pleased with the pairing, but I wasn’t blown away by it. It was a good red wine pairing, but I didn’t think it was quite $55 good. Now, next to a piece of dark chocolate towards the end of the evening, I would have at least entertained an offer for a small piece of my aforementioned soul. Really super there. For fans of premium California cabernet, I think you’re going to be pleased with this wine. If you’re looking for a holiday gift for a special someone, it’s a pretty solid option. I could certainly see the potential – especially if one were to lay a few bottles of this down for awhile. It’s certainly got the “bones” that could potentially mature into something really special. The price for Faust remains the same -- $55. I also see that Huneeus is producing a couple of single-vineyard reserve wines inspired by Faust’s story called “The Lure” and “The Pact” which retail for $75 apiece. 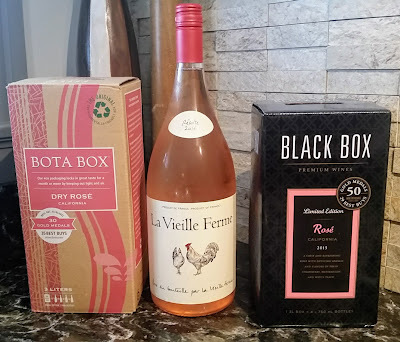 By this point in our online relationship, none of you should be surprised that I keep box wine around the house. As I've said before, I don’t keep it because it’s necessarily great wine. I keep it because I don’t always want to open up great wine. There are plenty of decent ones out there for when you just feel like being an unthinking sipper. 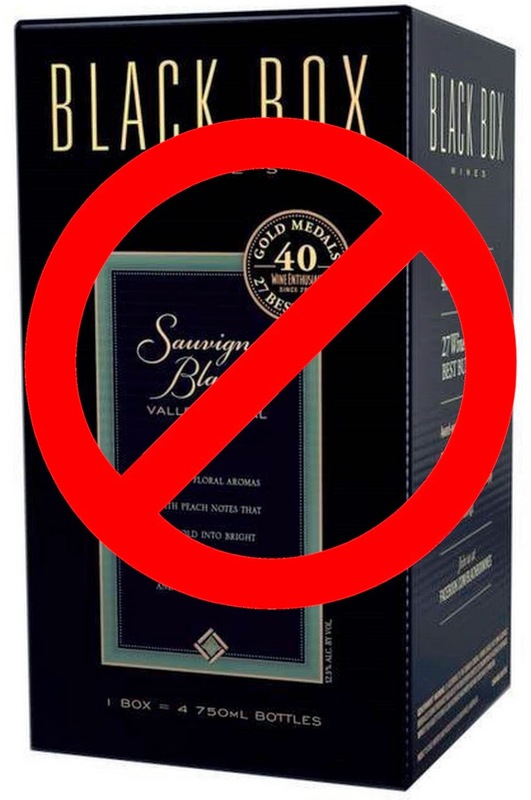 With a sense of regret, however, I must report that I'm swearing off the Naked Vine's unofficial-but-most-often-in-the-fridge "house wine," Black Box Sauvignon Blanc. I'm not saying farewell because the wine's bad. Honestly, it's as good a box white as I've come across in my various samplings and sloshings. No...the problem, honestly, is a mechanical one. Almost all box wines come with some sort of spigot at the bottom -- all the better to actually pour the wine. A few months back, I got a box of the Blanc just as I'd done on numerous occasions, chilled it, opened it up, poured a glass, and popped the box back in the fridge, thinking nothing of it. I came back about an hour later to a big ol' mess. The spigot didn't seal properly, and wine had leaked all over the top shelf of the fridge. Cursing a bit, I cleaned up the mess, laid the box on its back, and figured it was a one-off problem. Until I got the next box. And the next box. That's three in a row. All leaky. All messy. All making the Sweet Partner in Crime and I very unhappy. ...until the day after our family meal. Yes, another leaky box, and this one had some gumption. I'd estimate that probably a third of the box -- yes, that's a full liter of wine -- leaked into the fridge. Cleanup, as you might guess, was unpleasant with a fridge full of leftovers, stray vegetables, bottles of things, and various other sundries. If Black Box decides to redesign their spigot or find a new spout manufacturer, I could be enticed to return to the fold. For now, though -- I'm on the hunt for another good box of sluggable white. Any of you out there in Vine-land have suggestions? As it turns out, that particular account is actually managed by my friends Maggie and Lia at Colangelo, who were nice enough to step outside the world of wine with me for a minute and shoot me a sample of the stuff to try. So, after all this, what is Calvados? Calvados (pronounced KAL-vuh-dose) is a distilled spirit. Instead of coming from the fields like scotch and bourbon (made from grains) or from the vine like Cognac and Armagnac (made from wine) Calvados comes from the trees. Specifically, apple trees. The name “Calvados” comes from the area of Normandy in northern France where this spirit is produced. In the late 1800’s, when the phylloxera outbreak was wiping out most of the vineyards in Europe, the French turned to Calvados for an alcoholic alternative. Much of the distilling equipment was requisitioned for use in World War II. 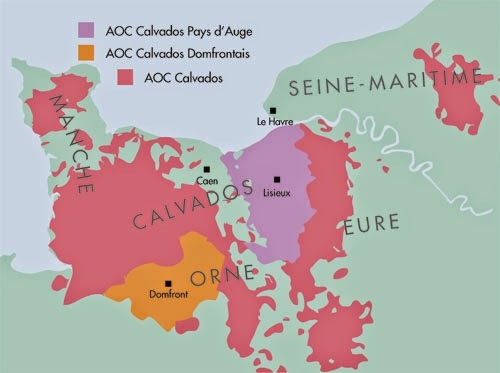 When the distilleries and cider houses were rebuilt, many of them were in the Pays d’Auge area of Calvados – which has become the best known area for the spirit. Calvados is produced from certain varieties of apples which are first pressed and fermented into a dry hard cider. The resulting hard cider (about 5-6% alcohol) is distilled into a brandy. There are around 300 different varieties of apples which can be used in Calvados – some of which are so bitter as to be inedible, so making them into booze seems like a logical use! Much like a blend wine draws its flavor and characteristics from the array of grape varietals, the blend of apple varieties and amounts in each Calvados creates a different flavor profile. Some regions add pears to the blend, but apples always comprise at least 70% of the blend. If you’re not familiar with the distilling process, the short version is this: the cider is put into a still and heated. Water, as you know from science class, boils at 212 degrees Fahrenheit. Ethyl alcohol – the stuff we drink – boils at a lower temperature, 172 degrees. The cider is heated to a particular point between those two temperatures. When the cider reaches the appropriate temperature, the alcohol will begin to vaporize and will rise from the liquid. Those vapors are collected and cooled in a condenser, and...voila!...you’ve got a distilled liquid of around 28-30% alcohol known as petit eau (“little water”). 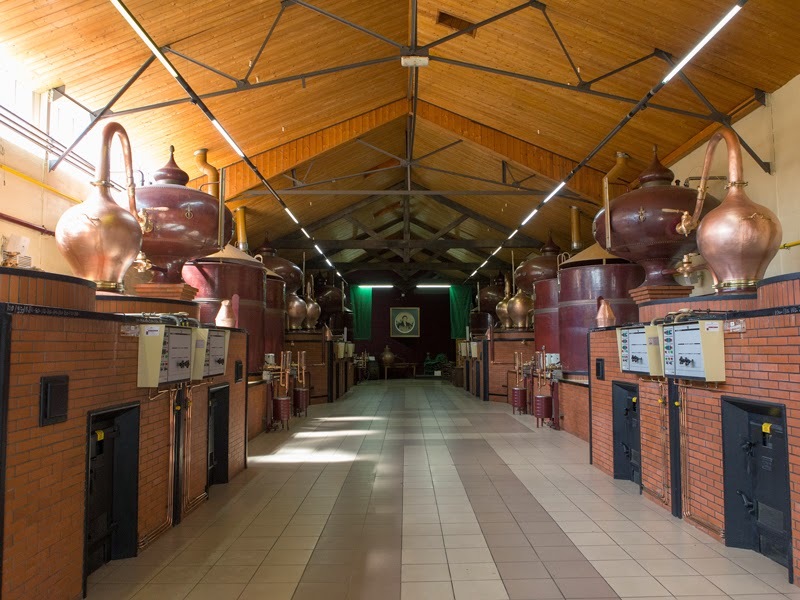 This petit eau also contains some water and other trace elements, so distillers will run that liquid back through the distiller a second (or third or sixth) time to both increase the alcohol content and purity, creating the high-alcohol beverage known as eau de vie, which literally translates as “water of life.” This spirit can be as high in alcohol as 70% at this stage in the process. The resulting brandy is then placed in well-seasoned oak casks and cut with water to the desired alcohol content, usually around 40%. The time in barrel allows the spirit to pick up colors and flavors from the wood. Most Calvados is aged in lightly toasted casks, so as not to impart too many smoke flavors or colors to the finished product. After a period of aging, the Calvados is then bottled. The length of the aging is the main determinant of the quality classification. “Fine” Calvados are aged for at least two years; “Vieux” or “Reserve” at least three; “VO” or “VSOP” at least four; and “XO” at least six years – but are commonly much older. Calvados can be made of spirits of varying years, but the youngest component of the blend determines the classification. I was sent a sample of the Calvados Boulard VSOP Pays d’Auge to sample. I’ve had applejack and domestic apple brandies before, so that’s what I had in mind – spirits that tasted strongly of apples, with a fair amount of residual sweetness. My first sip quickly disabused me of the notion that Calvados is anything like my previous libationary experiences. Calvados needs to be approached more like the brandy that it is – in a sipwise fashion. The aroma, which also had a bit of alcohol heat, reminded me of cinnamon covered dried apples. For an 80-proof liquor, it’s very smooth. I barely noticed a burn at all as it warmed from my throat to my belly with a light, slightly fruity feeling. The next exhale brought a breath of apples and vanilla. I thought it was very tasty, and it seems ideal for a cool (or cold!) evening. In a mixing glass, mix together 1 tbsp. honey with 1 tbsp hot water, so the honey becomes a thin syrup. Add ice, 2 oz. Calvados, and 4 dashes of bitters. Stir until well-mixed. Strain into a martini glass and give it twists of lemon and orange peel. Garnish with a slice of sweet apple. Calvados is a nice winter alternative to some standard winter beverages, especially if you enjoy whiskey cocktails. And if you’re a cider drinker – it’s worth trying just to see what happens when your favorite beverage gets distilled. 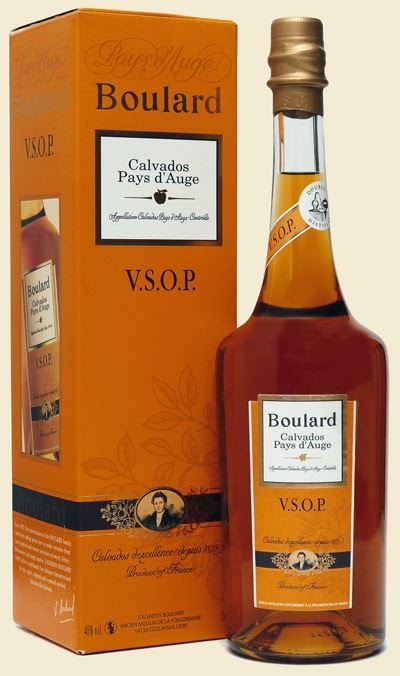 The Calvados Boulard VSOP Pays d’Auge I tried retails for $40 for a fifth. Definitely worth a try. Shawn Measel, one of the three proprietors of Fairborn’s Flat Rock Distillery, was breaking down the origin of various pieces and parts of Flat Rock’s homebuilt distiller. The Measel brothers, along with their former office manager, James Bagford, turned a floorful of repurposed rigging equipment into Flat Rock’s incubator for StillWrights, their now-available line of distilled spirits. The StillWrights lineup includes a straight bourbon, flavored and unflavored moonshines, and – soon – silver, spiced, and bourbon barrel-aged rums. Less than a decade ago, however, rather than winning medals, the three were hauling metal. Shawn and Brad’s father, Don Measel, opened Pyramid Riggers in the early 1980’s. Shawn, Brad, and their other two brothers worked there. It’s a tense business, they said. Millwrights’ busy seasons are during factory shutdowns – 4th of July, Thanksgiving, Christmas breaks, and the like – and they are required to hit very strict deadlines. Pyramid generally kept a core staff of 20-25 people on payroll, but that number would swell to 75 at peak times. of Flat Rock's homemade still. Shawn added, “We sketched it all out on paper and did a couple of designs. We’d start in and go, ‘Hey! We’ve got a new piece of pipe. Could we use this?’ and we’d make a few changes.” They first built an “experimental” 27 gallon still, which led to the construction of their 300 gallon main still, based on a design adapted from one they saw Louisville’s Vendome Copper & Brass Works. They also believe the attention to detail required in their millwright work translated neatly to distilling. With the batch size they produce, they’re able to keep tabs on everything from how “happy” the fermenting yeast is to precisely maintaining the proper temperatures during the mashing and distilling processes, since problems at any stage can create impurities in the final product. “The big distilleries can’t do that in a million-gallon run,” mused Shawn. “Everything goes into their barrels – guts, feathers, and all. That’s why a lot of them age their whiskey for so long – they’ve got to mellow out those defects – aldehydes and acetones and other nasty stuff. We don’t have that problem. “And our still kinda talks to us. In the still there’s a copper dome. As the vapor hits the dome and condenses, boils, and recondenses, it jiggles. And when we hear that thing rattling away like a jazz drummer going to town on a high hat, it’s letting us know that we need to really keep an eye on the temperature,” Shawn added, throwing in sound effects and air drums for good measure. Moonshine, the spirit they describe as “American as Revolution, Apple Pie, and Badassery,” does not have a precise legal definition. It’s classified by the federal government, according to James, as a “distilled spirit specialty,” meaning there are no particular criteria for production and aging, which is different than rum, bourbon, and other distillates, which have very specific guidelines. 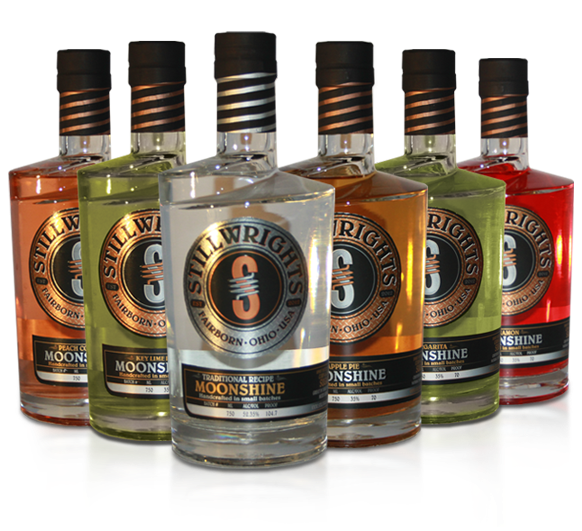 StillWrights unflavored moonshine clocks in at 104.7 proof, while their flavored versions are 70 proof. The first batch of StillWrights 90 proof bourbon is aged in 15 gallon casks for two years. 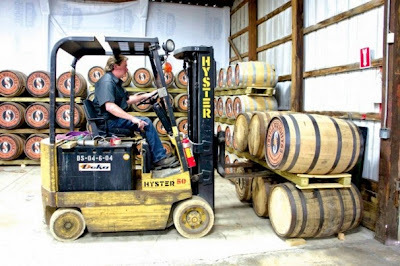 When that bourbon is all out of barrel, they’ll empty their 25 gallon barrels, which will have been aged for three. Eventually, they’ll move on to their four-year 53 gallon barrels, which will be their standard moving forward. Some of the used barrels are being used to age their rums, which should be released in July and August. StillWrights’ unique bottle design, which neatly complements their “Coiled S” logo, has an international flavor. A French company has a design competition every year for college seniors and they mass produce the winning bottle. Flat Rock’s design company happened upon the bottle just as it was released, immediately saw the connection, and snapped it up. The unflavored moonshine is dangerously easy to drink. It has a very even corn flavor with very little afterburn. The flavored moonshines were unique to my palate. I’m used to flavored liquors having one-note tastes, but these, produced in conjunction with Mother Murphy’s flavoring company, had multiple layers of flavor. The “Best in Show” key lime had complex flavors of graham cracker and meringue alongside the tart lime. The “peach cobbler” had savory notes of toasted oat to go along with the peach. The apple pie tasted like…well…apple pie. They also feature a margarita and a cinnamon version. The bourbon is quite enjoyable. It has an undertone of a scotch-like peat, and a little splash of water brings out considerable floral and vanilla notes to go along with a backbone of newly harvested grain. The flavors are all very distinct and, overall, it’s a very clean bourbon, with some maple syrup, corn, and cognac flavors at the end. StillWrights bourbon retails for $35 per bottle; the moonshines for $25. 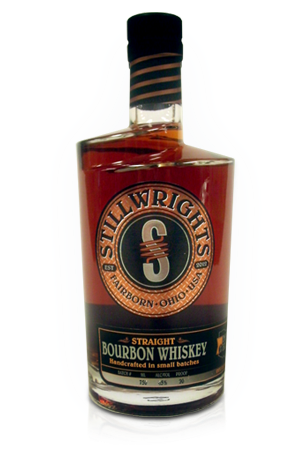 StillWrights can be purchased at the distillery’s tasting room -- as well as Arrow Wine South, Belmont Party Supply, Air City Wine, the Lebanon Kroger and Vandalia Carryout. Flat Rock Distillery is located at 5380 Intrastate Drive, Fairborn. 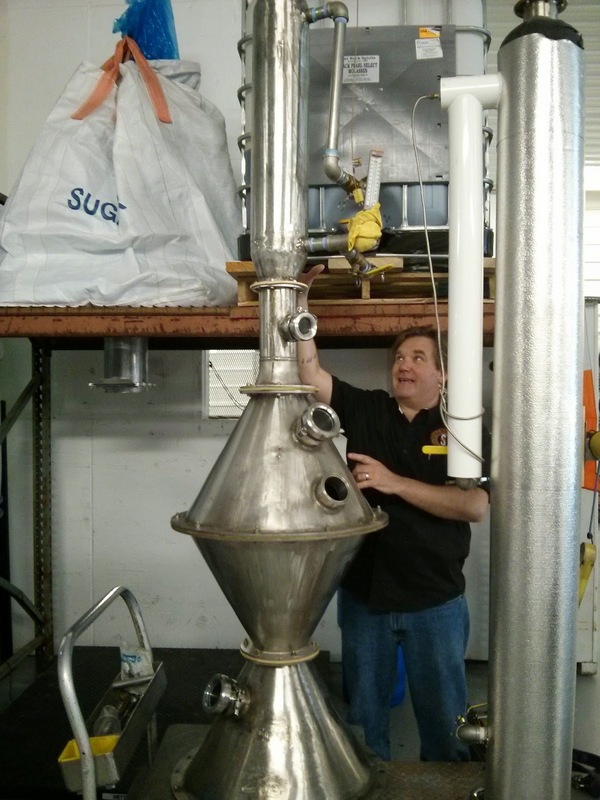 Tours, which include tastings of all their products, are $10 and can be arranged at http://flatrockspirits.com/product/distillery-tour/ -- by calling (937) 879-4447, or by emailing tours@flatrockspirits.com. 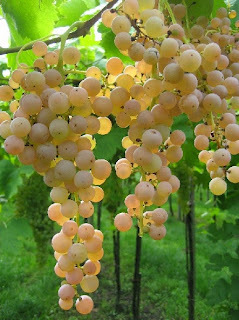 In any case, Soave is generally a dry, relatively light white. You might stumble across a sparkling Soave or a sweet, late harvest Soave from time to time – but for the most part, the fruity still white is what you’re going to see. Like most Italian wines, there are a couple of classifications to know. There’s a “standard” Soave. Next is “Soave Classico,” which is wine that comes from the originally designated vineyards of the Soave region. There’s also a “Superiore” classification, which indicates that the wines follow particular rules for composition, harvest tonnage, and a few other rules. To further complicate matters – most, but not all, of the Superiore vineyards are in the Classico area. Thankfully, you’re not going to need to worry much about those ins and outs. The price range on Soave isn’t a huge one. You can find a straight Soave for $10-12, and even the high end of the Soave Classico Superiore isn’t going to set you back much more than $25 or so. For most purposes, you shouldn’t need to spend more than $15, and there’s really no reason to, as you’ll see. I received a pair of Soave from Nicole at R/West. One was a standard Soave, the other was Soave Superiore. The verdicts? Corte Adami 2013 Soave – This one started me out with a light nose of orange blossoms and lemon. I expected it to be along the lines of a pinot grigio, but it turned out to be more weighty on the tongue than I thought. I thought it certainly had a little bit of a “glycerine” texture, which I didn’t mind, but some might consider the flavor a little “flabby.” The main flavors are round and peachy with little tartness towards the back. The finish hangs on and has a little bitter nip at the end. All in all, pretty decent for $12. While it’s not the most memorable wine in the world, it’s certainly a quality quaffer. Soave is currently promoting its wines as a Thanksgiving alternative to common table whites like Pinot Grigio and Sauvignon Blanc. If you’re looking for a white that’s a little different than the standard, you might want to consider trying out some Soave. Seeing how close the “high end models” are in price to the standard ones, I’d suggest you splurge on the inexpensive end of the Superiore. I think it’ll serve you well, whatever you’re plating up. Fall also means bigger wines, so as I amble down the Italian aisle, my eyes start to drift over to the section often simply labeled “Other Italian Reds.” Wine stores use this section to stash Italian bottles that don’t fit the traditional Italian designations. They can be blends of grapes from across a region, or even across the country. Many will be labeled “vino da tavola.” This translates as “table wine,” as you might guess – and they’re usually light, inoffensive, and forgettable. In contrast, the bottles I go for are have “IGT” on the label. An IGT designation indicates that a wine is of high quality, but does not adhere to the winemaking guidelines of the region. The most well-known IGT wines began appearing in the 1970’s in Tuscany. These wines became known as “Super Tuscans.” To illustrate, wines made in the Tuscan region of Chianti must be made from 75% or more Sangiovese juice to be labeled “Chianti.” IGT winemakers used grapes like Cabernet Sauvignon and Merlot to create bigger, fuller -- some traditionalists would argue “Americanized” – wines. Many of these Super Tuscan wines are made of a majority of grapes other than Sangiovese and command high prices. Prior to the creation of the IGT classification in 1992, any wine with less than 75% Sangiovese could only be labeled vino da tavola, regardless of quality or price range. In any case, I received a pair of Super Tuscan wines recently from Colangelo (Thanks, Maggie!) with compositions that don’t resemble Chianti in the slightest. I thought the two demonstrated a very interesting contrast. 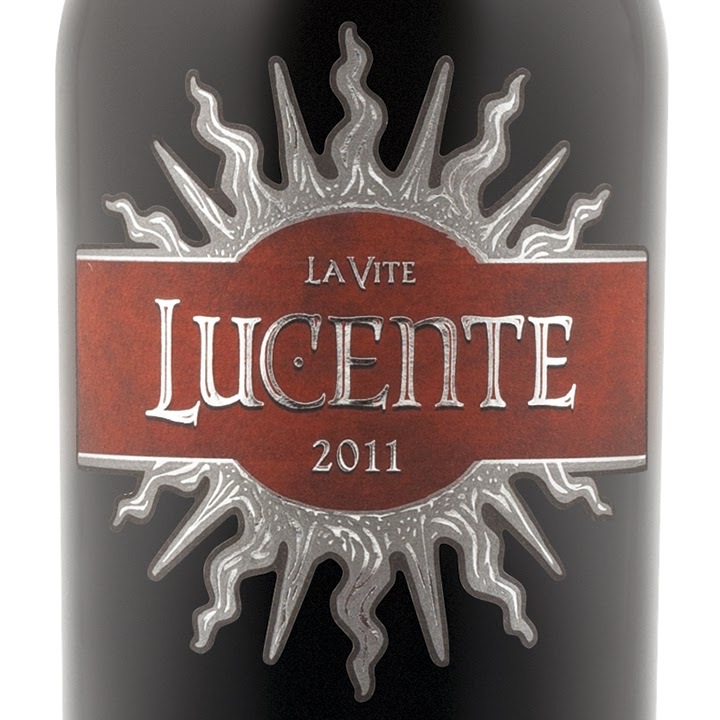 Luce Della Vite 2001 “Lucente” IGT – Lucente is the “second label” wine from Luce Della Vite. The “first label” wine, called “Luce,” is the first blend of Sangiovese and Merlot ever constructed in the commune of Montalcino. This wine, emerging from the partnership of well-known winemakers Robert Mondavi (now deceased) and Vittorio Frescobaldi, retails for close to $100. “Lucente” is the “little brother” wine, which goes for $20-25. For a little brother, Lucente shows some muscle. This blend of 75% Merlot and 25% Sangiovese comes on strong with big fruit, strong tannin, and high acid levels. That said, as powerful as it is, no sensation is really overwhelming. If you’ve got big foods, it’s got something for every occasion. You need some tannin for your eggplant parmesan? Done. Need some acid to go with that big tomato sauce? Check. Something dark and fruity for evening consumption? Gotcha. I had quite a bit of leftover tenderloin from the Barolo experiment, so we made steak sandwiches piled high with caramelized onions and sautéed mushrooms, which made for an absolutely delicious pairing. I think the Lucente is an exceptional value for the price range. 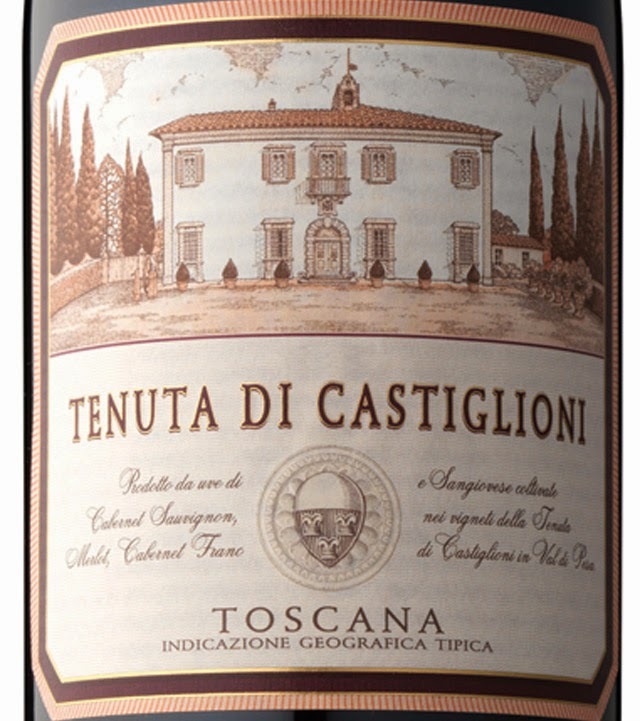 Tenuta Frescobaldi Castiglioni 2011 Toscana IGT – The Tenuta stands in contrast to the Lucente. The Lucente, as big and round as it was, still tasted like an Italian wine to me. On the other hand, if I’d been blindfolded, I easily could have thought the Tenuta might have been a California red blend with its big, dark, Cabernet-ish fruit. This makeup is 50% Cabernet Sauvignon, 30% Merlot, and 15% Cabernet Franc. Sangiovese comprises a mere 5% of this wine. Even after decanting, the fruit on this wine overwhelmed the acid and minerality found in many Tuscan wines. We had it both with minestrone and as a side-by-side with the Lucente and the aforementioned steak sandwiches and it was just OK. Don’t get me wrong – it’s a decent wine, but at $25 – if I wanted a fruity Italian wine, I could find a similar-in-quality Barbera for ten bucks less. Along with the pair of Tuscan tasties, tucked away in the package was a bottle of Perticaia 2009 Sagrantino di Montefalco, which retails for around $50. I wrote about the Sagrantino varietal about a year ago. This powerful red wine, which I dubbed “The Italian Heavy Hitter,” has the highest concentration of polyphenols – the compounds that make red wine so good for you – of any grape in the world. It also stains teeth more than any other red wine I’ve come across. 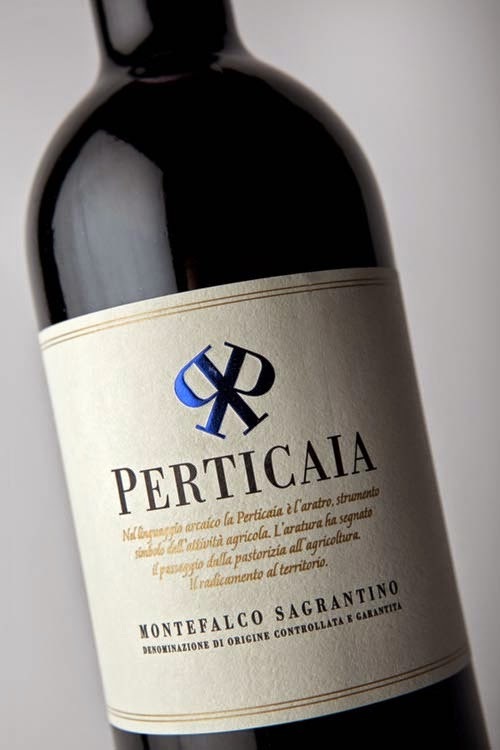 Of the bottles I tried back then, the Perticaia was my clear favorite of the three. The 2009 vintage is very much along the lines of the 2007 I reviewed previously. While big and tannic, it had enough balance to make it drinkable, and the finish of spices and berries was very pleasant. I’m happy to report that the 2009 is very similar to the 2007 – which means that it’s worth the price for a special occasion. We also discovered a fabulous food pairing for the Perticaia: the humble pot roast. If you want a funky twist for your next fall or winter dinner party, dust off your best pot roast recipe. Get your mom to divulge her secret recipe, or get your grandfather to divulge that twist that he brought over from the Old Country. Maybe you love a recipe that you found in a $1.99 slow cooker cookbook when you were in college. Find a recipe you can embrace. Serve it over rice, over noodles, over artisanal gluten-free amaranth shavings – whatever floats your boat. Before you start the roast, decant this wine. It needs a lot of air. When your roast is ready, plate it up, pass the platter and this bottle around your table of thankful friends, and enjoy your comfort food-laden bliss. It’s eyes-roll-back-in-your-head good. A bottle of Barolo – the Italian “Wine of Kings” – recently made its way to Vine HQ for a visit. Barolo doesn’t make many appearances around these parts. This wine from the same-named area of the Piedmont region commands respect on any wine list and an emptying of most wine drinkers’ wallets. Almost all Barolo are high-priced wines. Decent Barolo usually start at around $50 and go up from there. It’s not uncommon to see good vintages hung with pricetags upwards of $150. When this particular bottle showed up, thanks to the good folks at Colangelo, I did a double-reason double-take. 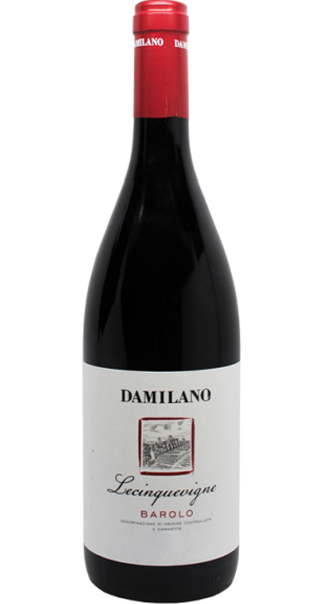 What was so different about the Damilano 2010 Barolo “Lecinquevigne”? First off, the vintage. 2010? Most Barolo, or so I understood, require around 7 years in bottle for its powerful tannins to chill out enough for the wine to become drinkable. Second – the retail on this wine was $35. Thirty-five clams for an actual Barolo? Inconthievable! OK, so what gives here? Why is Barolo so expensive, and how’d this wine end up being so much less so? And why can I supposedly pop and pour this bottle, when I’d expect to wait until 2017 under normal circumstances? Barolo is made from the Nebbiolo grape, a small, thin-skinned grape that’s notoriously hard to grow. The juice from Nebbiolo is super-high in both tannin and acidity. In the traditional method of making Barolo, the fermenting juice soaks with the skins of the grapes – a process called maceration -- for almost a month in some cases, extracting the maximum amount of tannin from the skins. The resulting juice is then aged in large containers called botti for at least two years and sometimes much longer. Once bottled, the wine had to sit for a long time, as I’ve already mentioned. The resulting Barolo’s tannic, powerful flavors can be challenging for many wine drinkers. In the 1980’s, the region went through what some writers termed the “Barolo Wars.” A group of winemakers, again influenced by their Burgundian counterparts, decided to employ more modern harvesting and winemaking techniques. These techniques included green harvesting (removing unripe grapes from ripening clusters to improve the remaining grapes), temperature-controlled fermentation, and the use of commercial yeast for more control over the product. Additionally, these modernist winemakers used smaller barrels called barriques. Barriques typically hold around 60 gallons of wine, compared to botti, which can hold up to 4,000 gallons. Smaller barrels and shorter maceration times combine to create wine that is more approachable flavor-wise and can be drunk after a shorter period of time. These “modern” Barolo tend not to have the extended aging capacity as their more “traditional” brethren. Which brings us to the Damilano. Damilano Winery was founded in the 1890’s, yet clearly falls on the “modern” end of the spectrum winemaking-wise. They make four “cru” Barolo (interesting that they’d use the French term) which are in the $70-80 range. The wine I received, the “Lecinquevigne,” is a blend of grapes from vineyards across these “cru.” Hence, it has a lower price – as seen with most second label wines. The name “Lecinquevigne” translates as “Five Vineyards” and has given my spellcheck a somewhat permanent case of the yips. I wasn’t hip to the history of the “wine wars” before starting this column, and the Barolo I’d tried previously had been, as far as I know, from the “traditional” end of the spectrum. I didn’t know the history when I took my notes, and I was somewhat reassured when I tasted this – because I thought there was something a little different about the Lecinquevigne. The nose flew at me rich and fragrant. I initially got strawberries, cotton candy, and some woodiness. The traditional “tar and roses” aroma that Barolo is known for emerged a bit as the wine got more air. But the flavors were soft and subtly dark. There’s plenty of mouth-coating tannin in the medium body, with notes of licorice, cherry, and leather. The finish is super-long, lots of strong tea flavor that lasts a couple of minutes if you let it. That said, I wouldn’t call it overly complex, compared to many other Barolo. This isn’t meant to be a slam; it is a really good wine. The intent of the modernist winemaker clearly shows through. Traditional Barolo’s power and harsh tannin is Exhibit A of the male end of the “masculine vs. feminine” wine divide. It is the “Wine of Kings,” after all. Modern Barolo has a much softer, “feminine” flair. I enjoyed the Lecinquevigne quite a bit, but it might not sit as well with traditional Barolo enthusiasts. I don’t know if it would pass the Uncle Alan test. We had this bottle over the course of two nights – once with a beef tenderloin braised in three wines, and again with a late-summer-veggie minestrone. Both worked very nicely with this more mellow version of Barolo. At $35, I’d certainly recommend it. I think it’s a pretty darned good wine – especially if you’re still learning about Barolo and deciding whether it’s for you. A) Approximately 25% of the population works in the wine industry. B) Its citizens consume the most alcohol per capita in the world. C) Is preparing to send much more of its wine to the United States. Your answer? Moldova – the Eastern European nation of three million people wedged between Romania and the Ukraine, currently preparing to make a much bigger splash in the American wine scene. While some indigenous Moldovan grapes are still raised, the bulk of their wine production is of grapes brought in from France, Italy, and Romania after WWII – cabernet sauvignon, merlot, pinot grigio, sauvignon blanc, et al. In the early 1900’s, Moldova had the largest grape-growing area in the Russian Empire – but the vineyards suffered during the two World Wars. The Soviet Union restored the wine-growing regions during the 40’s and 50’s. By the 1960’s, wine production had returned to pre-WWII levels. After the dissolution of the Soviet Union, wine production became one of Moldova’s major economic drivers, accounting for 7.5% of the value of all exports. In 2013, however, Moldova declared that it was planning to join the European Union. Almost immediately, Vladmir Putin declared a ban on imports of Moldovan wine, of which it was the largest importer in the world. Moldova clearly needs somewhere to sell its existing and future stocks of wine, and it has turned its sights to the West. With a handy assist from Secretary of State John Kerry, the Moldovan state publicity arm is launching its first campaign to promote their wines in the United States. I was able to dip my toe into the Moldovan wine pool when Tiffany at Colangelo sent me a couple of bottles of Moldova’s big export. I received one bottle of red and one bottle of white. How were they? 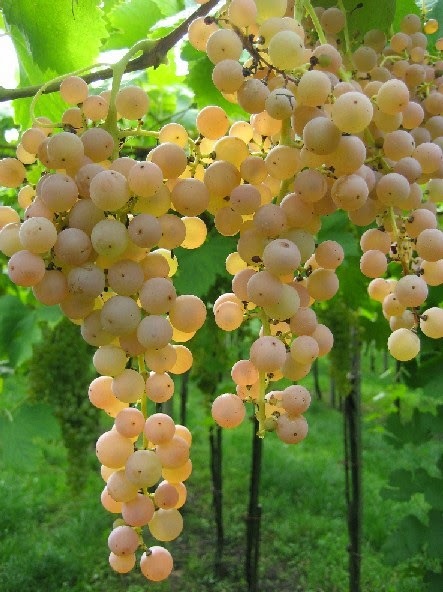 We started with the white – the Albastrele 2013 Pinot Grigio. This 100% pinot grigio started off with peach blossoms and a little apple on the nose. I thought it had solid weight for a pinot grigio, and it was well-balanced enough that it doesn’t feel artificially heavy. The palate had some nicely rounded flavors of pear, apple, and a little bit of baking spice. The finish was quite nice – lasting and gentle, starting a tad tart but never developing into anything overly acidic. I thought this was a very nicely designed white with much more complexity than I’d expect from most wines that say “pinot grigio” on the label. A quick spin around the Internet yields some listed prices from $11-13, which is an absolute steal for a wine of this quality. High marks for this bottle. The bottle of red – the Lion-Gri 2011 Saperavi Dry Red Wine – surprised me a couple of times. Saperavi is the grape varietal, native to Moldova’s sister country across the Black Sea, Georgia. When I saw the wine was only 12% alcohol, I expected to decant something that resembled Beaujolais. Turns out, “Saperavi” translates from Georgian as “paint” or “dye,” and I was a bit shocked when from the bottle poured squid ink! This is one of the “heaviest light wines” I’ve tried. The nose is heavy with dark fruit. The mouthfeel of this wine is fascinating. Everything hits at once: big cherry and plum fruits, strong upfront tannins, and plenty of acidity. It comes in strong like a young tannic cabernet, but then eases down into a gentle finish that isn’t overly strong. The second surprise was the price point. It retails for around $10, which is a ridiculously good price. Plus, I dig "Style & Quality" as a tagline. One of Moldova’s best known food items is called mămăligă, (meh-MEHL-eg-uh) a cornmeal porridge also well-known in Romania. Mămăligă is similar to a large polenta cake. On our recent trip to Sonoma, I enjoyed a roasted vegetable ragout on polenta at the Willow Wood Market Café. The Sweet Partner in Crime and I hoped to emulate this meal, which was as close as we were going to get to making mămăligă. We did our best copy job, using roasted eggplant, mushrooms, tomatoes, garlic, onion, and a green pepper for our ragout and cracked the Lion-Gri alongside. The big initial tannin meshed really well with the roasted eggplant and the acidity coupled well with the tomatoes. I’d also suggest giving the bottle a little bit of a chill before serving. In the interest of improving international relations with a country very interested in aligning itself with our allies in the E.U., I think we all have a responsibility to support their economy. Based on the quality of these two inexpensive bottles, I think your diplomatic efforts will be well worth it.